Supergreens Protein makes it easy to add more plant-based nutrition to your day! This shake combines a complete plant-based protein, highly nutrient dense organic spirulina & chlorella, organic super greens with alkalizing properties, fruits & veggies with radical fighting antioxidants, essential phytonutrients, fiber, and vitamins B12 & D3, for an all-in-one shake. 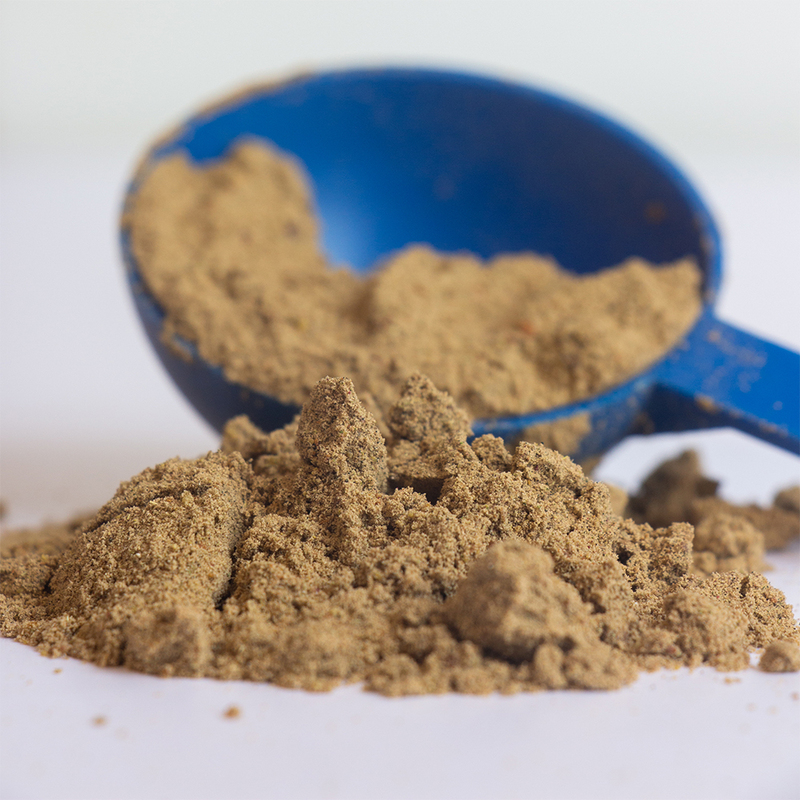 We’ve included pea protein, alkalizing foods like organic wheat grass, organic barley grass, super greens like organic spirulina, organic moringa, and antioxidants like maca, acelora, amla, flaxseeds, vegan vitamin B12, and plant-based vitamin D3. 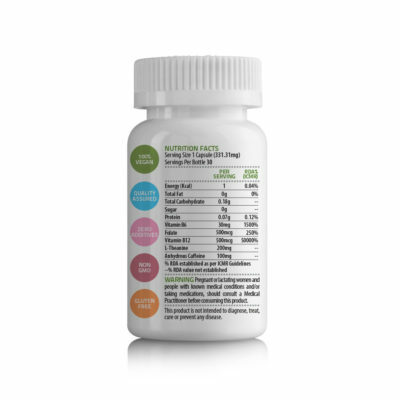 Unived’s Supergreens Protein is a convenient way to deliver food based vitamins, minerals, antioxidants, and proteins to support your daily health regimen. Non-GMO, gluten-free, soy-free, sugar-free, and preservative-free. The product is 100% vegan and gluten-free. There is absolutely no sugar added, making it diabetic-friendly! European yellow peas keep your body well supplied with energy, are high in fiber, low calorie, and nutrient-dense. Peas are a remarkable source of plant-based protein and amino acids. 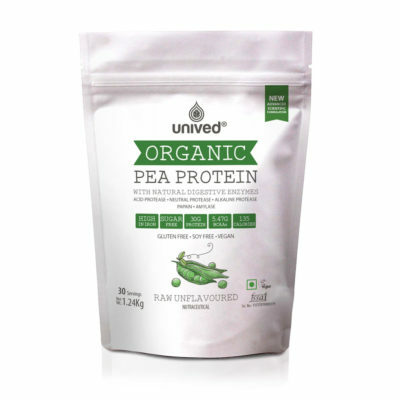 Protein from peas satisfies all essential amino acids requirements, necessary for building and maintain lean muscle. 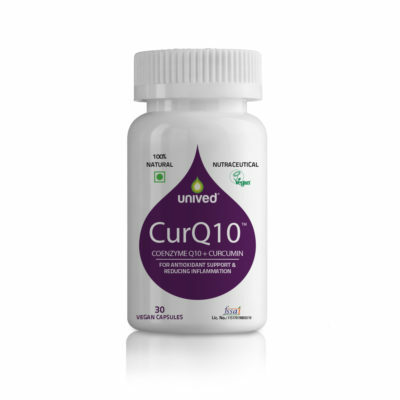 A dynamic herb with with several applications in enchancing human health with powerful anti-inflammatory and antioxidant properties. Vitamin B12 is a water-soluble vitamin that is naturally present in some foods. It is required for proper red blood cell formation, various neurological functions, as well as DNA synthesis. Vitamin B12 functions as a cofactor for methionine synthase and L-methylmalonyl-CoA mutase. 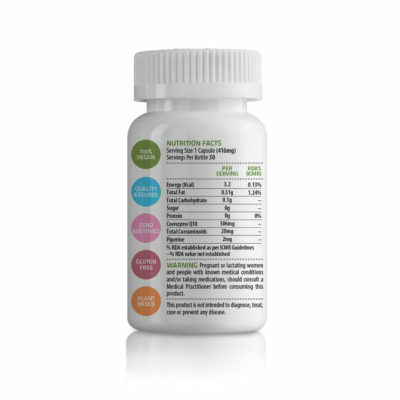 Sourced from a plant-based and vegan source, vitamin D3 is a fat-soluble substance necessary for the smooth working of several of the body’s physiological functions. Though it is most popularly known for its important role in bone heath, research has now revealed its relevance in overall health, prevention and cure of various ailments. 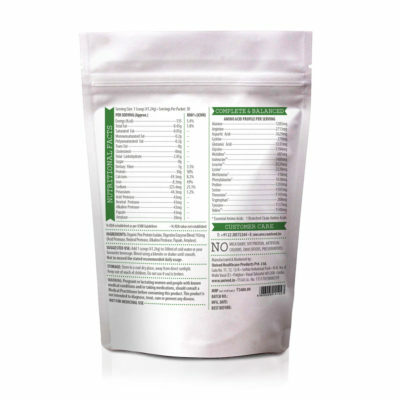 Pea Protein Isolate, Flaxseed, Cocoa Powder, Cinnamon, Vitamin B12 (as Methylcobalamin), Vitamin D3 (as Cholecalciferol), Super Green Blend (Organic Spirulina, Organic Chlorella (Cracked Cell-Wall), Organic Moringa, Withania Somnifera Extract, Organic Wheat Grass Powder, Organic Alfalfa Powder, Organic Barley Grass Powder, Spinach Powder), Antioxidant Blend (Amla Powder, Pomegranate Juice Powder, Carrot Powder, Beetroot Powder, Tomato Powder, Maca, Acerola Juice Powder), Chocolate Flavor, Stevia. If you are busy and don’t find the time to get in your protein, fruits & veggies – then Supergreens Protein is perfect for you. A single serving a day will help you get closer to your daily protein, nutrient, antioxidant, minerals, fiber, and vitamin requirements. Though it is not only for busy bees, and anyone looking to boost their overall well-being, boost energy levels and improve vitality can incorporate it into their daily health regimen. 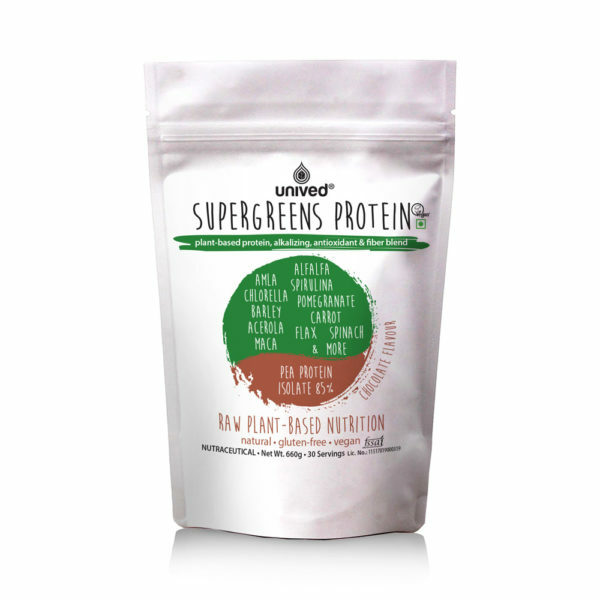 We recommend consuming Supergreens Protein first thing in the morning to start your day, or whenever you are craving a great tasting smoothie! Add 1 scoop (22g) of Supergreens Protein to 8 oz (240 ml) of water or your favorite smoothie! Can I add it to a smoothie? Yes! 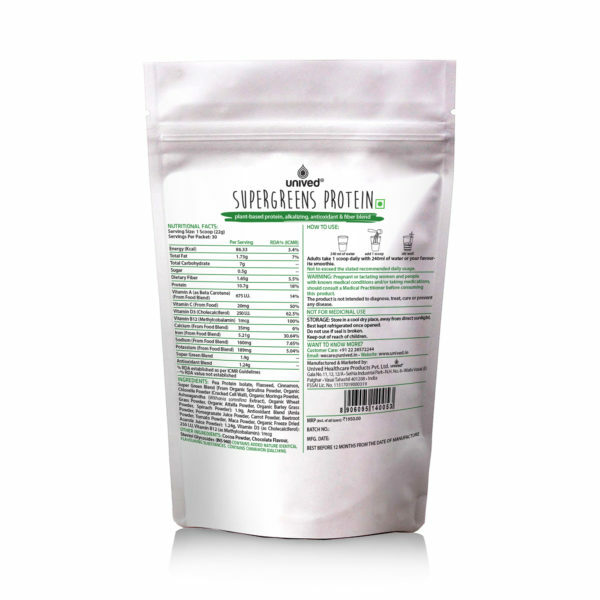 Supergreens Protein can be added to smoothies. 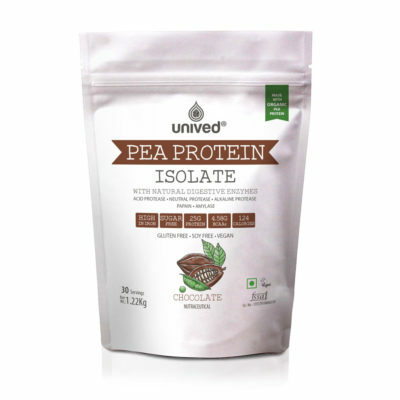 Organic Pea Protein with Natural Digestive enzymes.